All crawl history in awesome dashboard. 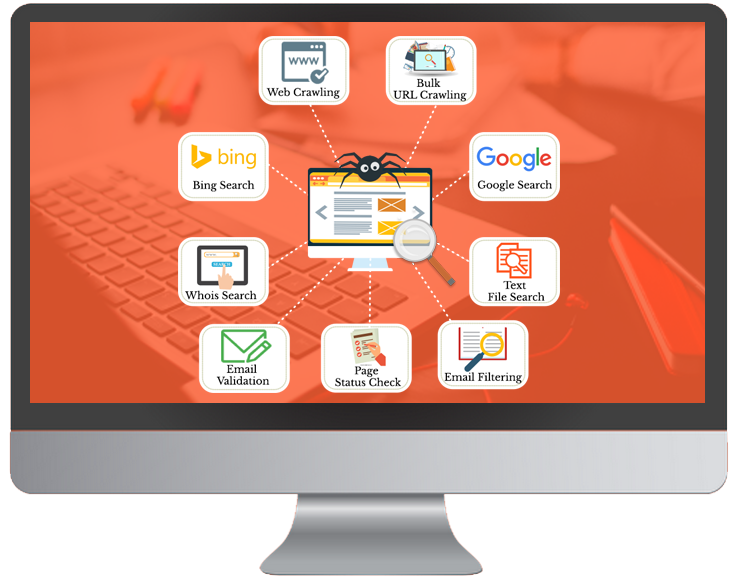 Website crawl, url crawl, search engine comparison,email found comparison, whois data report, page status report , all are in a single eye catching dashboard. uScraper is most powerful web based tool to extract emails by various techniques like website crawl, URL crawl, search in Google/Bing, search in txt file.It has ability to scrape encoded email.The ASCII encoded email can be decoded by this tool.Not only that by this tools can check email validation (pattern, MX record) , search for whois data, filter your email list by removing duplicate emails, check web page status .It is designed carefully so that you can install and use it very easily. Crawl full website. Crawl bulk url , uploading it from txt/csv file. It can decrypt ecoded email. So no problem to scrape encryted email. uScraper is most powerful web based tool to extract emails by various techniques like website crawl, URL crawl, search in Google/Bing, search in txt file. Not only that by this tools can check email validation (pattern, MX record) , search for whois data, filter your email list by removing duplicate emails, check web page status .It is designed carefully so that you can install and use it very easily. Enter website address. The tool then start to find all url of the website and scrape email address from all urls. It can extract encoded email too. Upload your url from text or csv file. Start scraping all url. The tool then start to scrape email from all url you have uploaded. Search in Google with keyword, then select sites like facebook.com, linkedin.com, twitter.com or other sites to extract desired emails. Search in Bing with keyword, then select sites like facebook.com, linkedin.com, twitter.com or other sites to extract desired emails. Get the doamin's whois information like admin email, technical email, name server, created date, expired date, last update date, sponsor. Have bulk search ability. Check email is valid or invalid. Bulk checking facility is available. We check email pattern and MX record for validity checking. Check page status like , is it live or not found(404) and other 56 http responses. Bulk checking facility is available. Make your email list by removing duplicate email. Import txt or csv or put email in textarea, export list with unique email as txt / csv. Search email in doc /docx file. You can upload bulk doc /docx files and extract email from all doc /docx files. Search email in pdf file. You can upload bulk PDF files and extract email from all pdf files. Search email in JSON / XML file. You can upload bulk JSON / XML files and extract email from all JSON / XML files. Search email in text file. You can upload bulk text files and extract email from all text files. 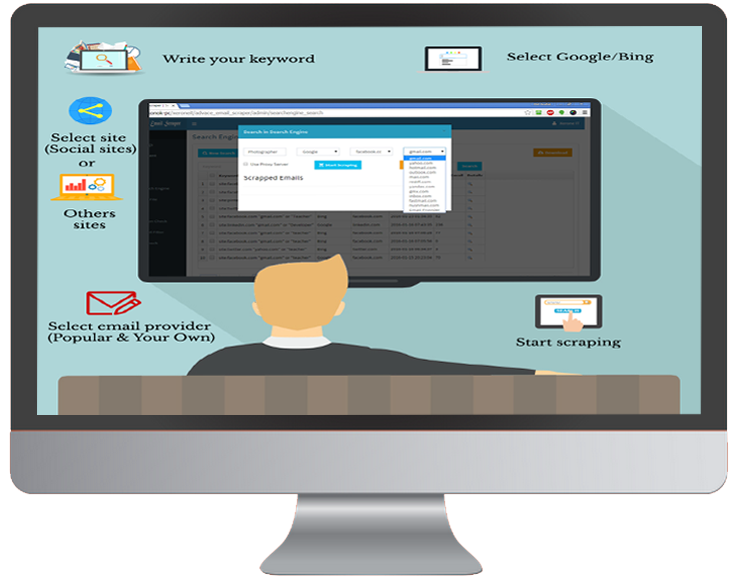 How email scraping works ? Very simple. Just imagine you want to do your product marketing and need email address to let them know about your product.Think how much time consuming it is to collect email from google or Bing? We have made this work as easy like a click simple. Let say, you want people who are engaged in webdesign profession. So webdesign is your keyword. Put this keyword in the input field, then select Google or Bing for searching. Then try to more specific by selecting social network from where you want to collect. Then choose what email you want gmail, yahoo, hotmail, outlook etc. You are done! Start scraping. You don’t need to do anything more.Wait and see the magic of the tools. Get early access to uScraper today! © 2019 uScraper | All Rights Reserved.